9/28/2010 – Usually, everybody pays attention only to the Presidential elections, but the FIDE Congress is not solely about elections. Currently, the 81st FIDE Congress is underway in Khanty-Mansiysk, and will last until October 2nd. Olena Boytsun, a member of the Ukrainian delegation, has been faithfully attending the meetings and has sent us this comprehensive report. On the 24th of September 2010 the 81st FIDE Congress started in Khanty-Mansiysk. It will continue for nine days, and will end on the 2nd of October 2010. The full schedule of the Congress can be found at FIDE.com or at the official web-site of the 39rd Chess Olympid. The FIDE Congress is not only about elections. It consists of several important meetings prior to the elections and the General Assembly: meetings of the Commission, Executive Board meeting, and Continental meetings. Those events are crucial for that basic work of chess development that should be done whatever the result of the elections. FIDE Congresses are held annually, while the elections are only once in four years. Although Congresses are held rather often, the information about the activities is sometimes limited. As the representative of the Association of Chess Professionals to FIDE during 2009-2010 I attended mostly all FIDE official meetings, including FIDE Congresses and Presidential Boards, and my conclusion was that actually there is a lot of information that just doesn’t go out, because nobody provides it, although nobody would be against it. This may sound strange, but several FIDE officials in private conversations confirmed that they felt that the Public Relations work of FIDE about FIDE itself is “to some extent insufficient”. In my opinion, the events of FIDE Congress are both interesting and important, and so deserve to be publicised. I attend the FIDE Congress as the representative of the Ukrainian Chess Federation and will be glad to share my impressions. The first three days of the FIDE Congress are devoted to the meetings of the Commissions of which there are 17 working in FIDE. During September 24-26, 2010 I attended the meetings of five Commissions. In general every meeting continues for two hours. However, some discussions lasted much longer, as for example the meeting of the CACDEC Commission for Development, which took more than four hours. The first Commission I attended was the Chess in Schools Commission (CISC) on the morning of the Day one of the Congress. The meeting started with the minute of silence in the memory of Florencio Campomanes, who founded the Commission in 1986 in Dubai. The Head of the Commission, Prof. Dr. Uvencio Blanco, reported on the CISC activities of 2010. The report contained the description of a number of activities, connecting with Chess in Schools Commission around the world and was without hesitation approved by the Commission members. There were more than 40 events mentioned. The Secretary of the CISC, Dr. Alexander Kostiev, took the floor and emphasized the importance of developing the title of Chess in Schools instructor. During the discussions it was decided to change the name to "FIDE Teacher" with implementation of three grades: basic, medium, advanced. Leontxo Garcia, the well-known Spanish chess journalist and promoter, held a presentation on the subject “Chess, a fascinating school of creative thinking”. He had made a study putting together different arguments on chess advantages as well as promotional possibilities. In his presentation Mr. Garcia cited Siegbert Tarrasch: “Chess, like love, like music, has the power to make people happy”, which perfectly described the sense of the chess development within the world. The question of marketing the game of chess is very topical now, and only after a deep consideration will it be possible to develop interesting and useful chess projects. As Chess in Schools projects dramatically increase the number of people involved into the chess, one can without hesitation think of them as a part of Marketing and Development program. The increase in numbers of the target group will in the end result in boost of other projects, as, for example, cooperation with sponsors. The representatives of several national federations took the floor and shared their experience of implementing Chess in Schools projects in their countries. Margaret Murphy of US Virgin Islands talked about the way her federation tries to implement the project. Being a science teacher herself, Mrs Murphy tried to combine mathematics and chess, and so to motivate math teachers to be involved into the chess teaching process more actively. Margaret also noted that she started a chess class for female only. Gihan El Sahhar of Egypt spoke about mixed groups and motivation for children: in Egypt the groups, where boys and girls compete together, are the strongest and children are more motivated to learn and show good results. Three years ago Egypt signed the agreement with the Ministry of Education to start a Chess in Schools project, and so the preparation of materials started: books to be translated into Arabic, the curriculum to be ready etc. In the next school year the Egyptian Chess Federation believes it will be possible to put chess lessons into the main school timetable of children. Ian Wilkinson of Jamaica Chess Federation noted that in his country the program of “teaching teachers” is working: any school can send ten teachers to take chess lessons. Because they are already trained teachers, it will be easier for them to adjust the material for children. Ian also shared his views on chess promotion: any possibility should be used, any interesting case or target group, for example the people on the street, that could see a chess decorated car with the advertisement of the local chess club. Tshepo Sitale of the Botswana Chess Federation called every national federation for cooperation in terms of Chess in Schools and especially to provide guidance for developing federations that are only starting the project. Nicolas Barrera of Argentinean Chess Federation invited the participants of the Commission to Argentina, where the Congress on Chess in Schools is planned to be held in 2011. The plans of the Commission for the next years are ambitious and I hope that all of them can be implemented. It was very interesting to follow the high-level discussions. For me personally it was incredible important to hear that the process of marketing chess is considered to be valuable within CISC. I had been developing this subject for the last years (see for example the ChessBase report Round table on Chess Promotion) and in the future hope to contribute more for the Chess in Schools project as the Marketing Director of the Ukrainian Chess Federation. I am a member of the Events Commission on the quota of the Association of Chess Professionals. The Chairman of the Commission, Ignatius Leong, noted that the development of the FIDE Chess Calendar is the main task of this body. The calendar for 2010-2011 was shared among those who attended, and Mr. Leong, who is also the Secretary General of FIDE, suggested the calendar to be extended with major private events within continents. The volunteers among participants of the meeting to control and choose such events were selected. The Councilor of the Commission Stewart Reuben informed the Congress about the project that the Commission was running: stipends for organizers of events. Every year the Commission has the budget for providing stipend for new or supporting old innovative and interesting events. The overall budget is Euro 5000, and it can be divided amongst different organizers. It was noted that not so many applications are usually received, and so the organizers could be more active in this matter. Probably, the stipends should be also promoted more actively. Theodoros Tsorbatzouglou of ECU proposed a new task for Events Commission: to develop stable requirements for evaluating the bids for events. In FIDE there is World Championships and Olympiads Commission that takes care of those events; however, for all other FIDE events there are no strict rules for evaluation of applications. Theodoros suggested taking an example from the European Chess Union, where such evaluation criteria are in use. The criteria are, of course, not perfect, as recently there was a situation within the ECU when some members complained. But at least such a system should be developed and than improved, if needed. Mr. Leong agreed that this would be a perfect reason for the Commission to act. Unfortunately, only four members of the Commission, including myself, were present, however the representatives of different federations took active part in the meeting, as for example, Argentina and Egypt. The Commission meeting was scheduled on the second day of the FIDE Congress, the 25th of September 2010, from 9:00 until 13:00. Although the beginning was early in the morning, the meeting was well attended. I expected that the subject of supporting developing countries will attract the representatives of the election campaigns of both Kirsan Iljumzhinov and Anatoly Karpov, and so at the audience one could hear Richard Conn, who is running for the Deputy President on the Karpov’s ticket, as well as the current FIDE Commercial Director Geoffrey Borg of Malta. The Chairman of Development CACDEC Commission (DEV) Allan Herbert of Barbados started the meeting with the minute of silence in memory of the FIDE Honored President Florencio Campomanes. Then Nigel Freeman, the FIDE Treasurer, who is also running for the position of Treasurer on the ticket of Kirsan Iljumzhinov, reported on the Commission’s budget. According to the information, the budget for 2006 was about Euro 50,000, while for 2010 it was increased to Euro 200,000, with 40% of the money going to countries of Africa. Allan Herbert also announced that the organizers of the Olympiads will be providing stipends for developing federations that qualify to the Level 1 and Level 2, according to an evaluation system developed by DEV in order to understand the needs of the federations. Such stipends are not a requirement of the Olympiad handbook, but it has already become a tradition to provide a daily allowance for participants from CACDEC countries. As I was told later by participants of past Olympiads, it was also the tradition to provide daily allowance to grandmasters from all countries. However, than at some point it was decided to set the budget for developing countries only. 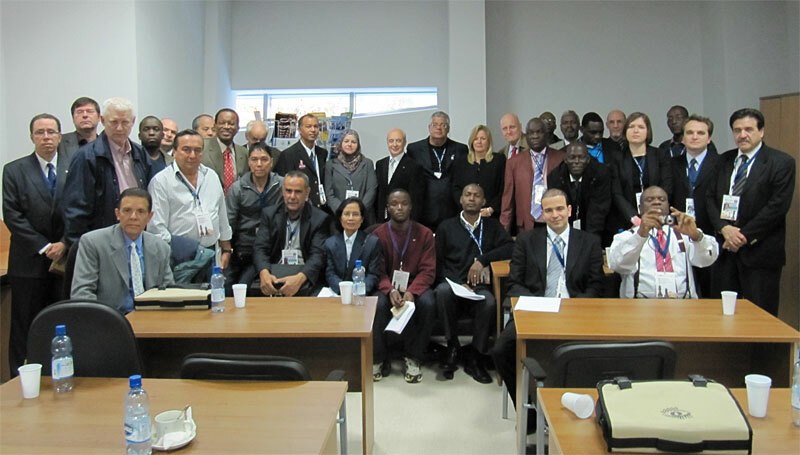 The Continental Presidents for Africa, Dabilani Buthali, and for Americas, Jorge Vega, as well as Casto Abundo on behalf of the Continental President for Asia reported on the activities of their continents. Those included seminars for arbiters and trainers in collaboration with the Trainers Commission. However, there was some kind of confusion when on the question from the audience arose as to how many people from Africa took part at the seminars. The answer could not be provided. Internet based seminars were called very perspective, as they help to cut travel costs, but the regulations for such events are still to be developed. As far as I understood from the questions of the audience, the main needs of the CACDEC federations include basic chess equipments (chess sets, clocks), study materials (books, manuals) and human resources trainings (players, trainers, arbiters etc). Participants also underlined the importance of Chess in Schools projects, because “sponsors look for numbers” – the more people are involved in the chess circles, the more likely chess will receive investors – and also “young chess stars are like magnets for sponsors”. There was also a debate on zoning African continent, but it was decided to schedule for the Continental meeting. The Chairman noted that for any activity and financing there should be a proposal from the federation. No proposal means no event. Federations were heavily called upon to submit their requests to the Commission. Concerning the electoral processes, Mr. Herbert pointed out to the participants of the CACDEC countries: “Don’t forget to ask the representatives of both electoral campaigns what they are going to do for developing countries”. There are currently two Co-Chairs of the Commission for Women’s Chess (WOM): Alexandra Kosteniuk and Susan Polgar, who both were present and chaired the meeting. The report on the Commissions activities for 2009-2010 was made. The main activities included the FIDE Trainers’ Seminar for female participants, organized in May 7-9, 2010, in cooperation with organizers, who provided invitations for women players through WOM, implementation of FIDE Caissa Award that was awarded to Nadezhda Kosintseva in 2010 as well as FIDE Golden Organizer Award that the organizers from Belgrade received for their annual international female tournament of the8th of March (International Women’s Day). It was specified that for development of women chess more female coaches and arbiters are needed. Ignatius Leong, who was present at the meeting, noted that at the Chess Academy in Singapore he was running, 25% of the trainers are female. For 2011 more goodwill events are planned (in 2010 the Secretary of the Commission Martha Fierro conducted several events) as well as conferences and seminars. This is the new web-site of the WOM. I also would like to add that during the past years another aspect of female involvement into chess processes has developed vigorously: it is chess journalism. I remember how in 2004 during my first work at the press center of the Dortmund Chess Meeting there was only one other female chess journalist – Marina Makarycheva of Russian TV Channel NTV+. I always tried encouraging more women chess players to collect information, write and make photos. Nowadays in the press-center about 50% of journalists are female, and it is also worth mentioning that both Alexandra and Susan are chess journalists themselves. One of the last meetings of the third day of the FIDE Congress was the meeting of the Trainers Commission (TRG). All aspects of trainers work were discussed, starting from study materials up to the criteria of title certification. It was announced that since January 2010 no trainer has been or will in the future be allowed to work and receive lodging and boarding at the official FIDE events if he or she doesn’t have the FIDE title and didn’t go through the certification process. As for the TRG’s budget, the amount was Euro 90,000 for 2010 and Euro 82,000 for 2009, which were provided for different projects and events, including educational seminars. FIDE President Kirsan Ilumzhinov came after the coffee break in order to congratulate the winners of the annual FIDE Trainer Award that was in operation by the TRG. The most prominent trainers work in this commission already, which was again confirmed by the fact that the Trainer award for different aspects of training work in 2010 was awarded to both the Chairman of the Commission Adrian Mikhalchishin and the Secretary of the Commission Efstratios Grivas. Zurab Azmaiparashvili also received the award for team trainer activities, and Kirsan Iljumzhinov announced that GM Azmaiparashvili is running individually for the position of the FIDE Vice-President and will receive the full support from the current FIDE President. At the very end of the meeting Kirsan Iljumzhinov signed a calendar with his photo for visitors. The Trainers Commission has a well functioning web-site that is full of information, including the information on the Trainers Awards for 2010. It should be also noted that FIDE Commissions cooperate with each other and provide joint activities as well. For example, Chess in Schools Projects are in line with activities of the CACDEC Development Commission. Developing countries need training, which can be organized in cooperation with Trainers Commission etc. In general, Commissions has worked during three out of nine days of the FIDE Congress. The Congress events to follow further are the Executive Board meeting (Day 4), Continental meetings (Day 5), elections of Continental Presidents (the evening of Day 6) and the highlight – the General Assembly (Day 6 – Day 9) with the election of the FIDE President taking place at the Day 6 on the 29th of September 2010. After working on her PhD in International Economics at the Russian and Eurasian Studies Center, at St. Antony's College, Oxford University, Olena Boytsun returned to Ukraine and is currently living in Kiev. She was the General Secretary of the International Association of Chess Professionals (ACP) and works in marketing and PR for chess projects. Since June 2010 she is the Marketing Director of the Ukrainian Chess Federation. Olena has played chess since her childhood. Her current title is Woman International Master. She is a regular contributor to the ChessBase news page. Dima’s Defence – you can help!